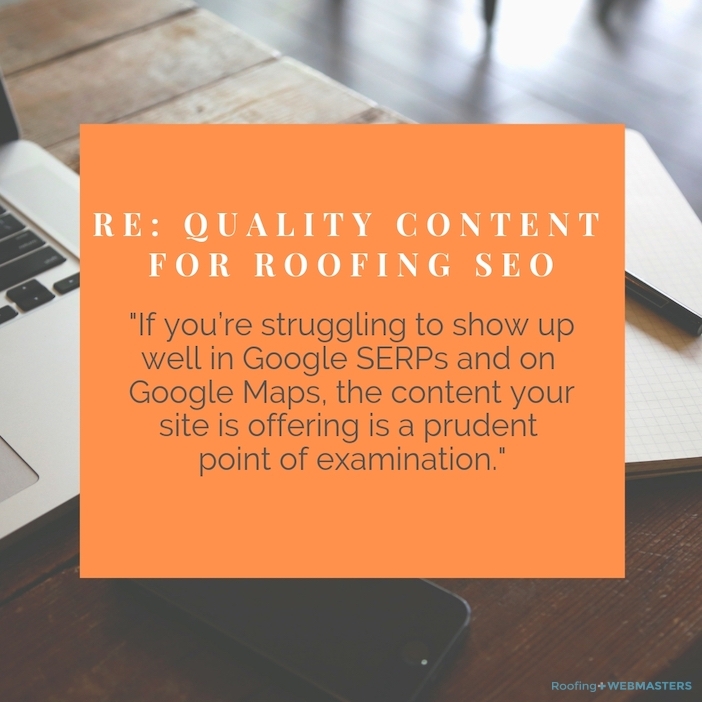 What Is Considered Quality Content For Roofing SEO In 2019? If I had to pick one element that could make or break a roofing company website, it’s content. There are many, many aspects of web design and development, SEO, and internet marketing that should be managed well to effectively compete with other roofers (especially in dense service areas), but the heart of it is all is quality content. If you’re not providing deep, relevant content for roofing repairs and services to serve both potential customers and search engines like Google, you’re not going to see results from other efforts. It’s a cumulative effect, and you can’t afford to no-show for this very powerful component. So what does quality content for roofers look like in 2019? Given the constant changes in web marketing and search engine algorithms, it’s important to keep with the times and ensure you (or your SEO management team) are poised for success to keep your business thriving and your techs busy! Because many roofers are still a bit skeptical about whether or not they even need a website for roofing services, it’s not uncommon for us to come across clients whose existing sites are malnourished, so to speak. Or to be more precise, they’re hopped up on junk food. They may have a domain up and running, but the pages are minimal and the content is a hot mess. It used to be fairly common practice for corner-cutting SEO companies to churn out webpages that amounted to little more than subject-specific spam. Sure, it was moderately germane to roofing, but the actual words were a garbled disaster of keywords, crammed together in an attempt to trick search engines into better ranking. It’s 2019, folks, and this crap won’t fly. Google has, with each algorithm release, increasingly drawn the line on what good content is for SEO, and what is not only considered bad, but will actually get you punished. It baffles the mind that some people still try to take this approach, especially given that Google is explicit in their rules around quality content. Not to mention, who is reading that junk? If the point of a website is to attract new customers and/or appeal to search engines to get more traffic, keyword stuffing is accomplishing neither. The takeaway here isn’t to avoid keywords. Roofing keywords are still really important to optimize well for the services you offer and area you serve. Choosing the right keywords is important, but utilizing them well is the real key. By incorporating them prominently in your content in a natural way, potential customers will find the information on your website helpful and valuable for their search. Use some of our suggested keywords and keyword phrases to help anchor your webpages around subjects that are relevant to roofing, but also popular enough to warrant lots of searches. By optimizing for both popular and less common keywords related to roof repairs, you can make steady progress on ranking better. One of the biggest SEO mistakes for roofers that we identified a few months ago was scraping content. Because of the lackadaisical attitude toward their website, we’ve seen clients who actually paid for plagiarized content from a web marketing company and had no idea that it was likely killing them in the local keyword rankings. If you’re struggling to show up well in Google SERPs and on Google Maps, the content your site is offering is a prudent point of examination. Having stated the obvious that quality content means original content, it’s important not to get saddled with the idea that you’ll never be able to contribute content for your own site. That’s simply not true. It’s understandable that you may not want to take on this responsibility, given the sheer volume on your plate as a business owner and busy roofer. But if you have a desire to manage some aspect of your SEO content writing in-house, it’s not rocket science. Posting to an internal blog (meaning it’s part of your main business site, not on a different platform) is a great way for our clients to take the helm on publishing content that is truly from their own mouths, so to speak. Google loves to see regular updates to your website, and publishing new blog posts is a great way to show steady activity. But we’re not asking you to become a bonafide blogger. Even just a post once a month can do your site some good, with more frequent posts driving up the value. Content Marketing is an approach that really makes the priority awesome content and valuable resources that help drive leads to your roofing company. The focus here is not on explicitly pushing your brand name, but on making your expertise well-known and establishing yourself as a trusted authority for roof repairs. If you think about, this is a great perspective for blogging, as it gives a sense of purpose to every post. The best blog post titles are actually questions your customers may ask, literally posed as a question. Those optimize beautiful for queries, especially since you’ve honed in on a specific user intent! Use The Buddy System For SEO Content Writing: Proofreading Matters! There is a more lax approach sometimes taken in terms of content published online, but remember that every piece of text you put out there — be it a blog post, a webpage, a social media post, or a citation listing — is representing your roofing business. You are not going to look very professional if every other sentence on your homepage is littered with typos, or if the content of service pages is difficult to decipher through awful sentence structure and punctuation snafus galore! This doesn’t mean you need to brush up on a style guide before ever attempting to post, but it’s a great idea to employ the Buddy System when it comes to content writing. Our team always proofreads content we deliver for our clients, making a stop through the editor or at least a copywriting colleague before shipping. Having someone else read through your roofing content will help catch simple mistakes that are easy to overlook as you craft the copy (because the brain will often see what you meant to write, not necessarily what is there), as well as help you validate that the information is clear and/or addresses the question/need as desired. Whether it’s Google My Business, Angie’s List, Yelp, or any other third-party site that references your company as a listing, it’s important to claim that online citation to ensure the NAP information is correct. Beyond that, claiming and managing that listing is another great opportunity to put your strong roofing keywords to good use and include some unique, quality content. I find that a lot of these listings are done hastily and without much thought, so be sure to proofread these too, as they’re a valid entry point for new customers looking specifically for your services! OK, so Shakespeare’s writing about roofing would likely be rather poor given he wasn’t a roofer. (Remember our tip to write what you know! That goes for this guy, too.) But the point remains that you don’t have to be a professional copywriter to still present a professional front for your business. Quality content is all about serving the viewer and ensuring that it’s clear what your roofing company offers to best rank on Google and boost your SEO. More so than ever, 2019 is all about relevant content that helps a user get the information they want. So put your best foot forward with roofing online marketing that is helpful and crafted with care!